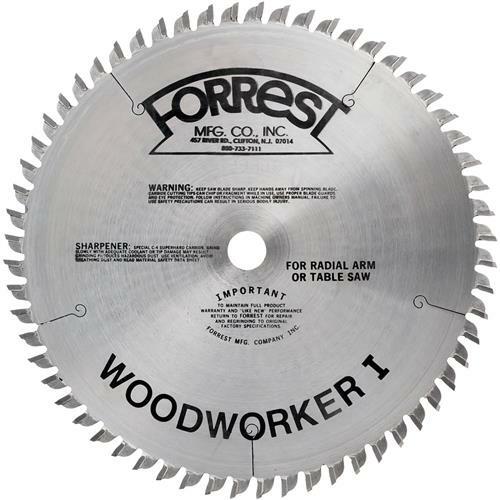 Hailed as the Cadillac of all blades, Forrest saw blades have become legendary for their ability to leave highly polished, finish ready surfaces on nearly everything they cut. Choose the style best suited for your cutting needs and see why Forrest has earned the reputation for being the saw blade by which all others are judged. Made in USA. For radial saws and table saws. These all purpose blades give scratch-free polished cuts on wood. Crosscut up to 2" thick. Rip up to 1" thick. They have a 30º alternate top bevel with a 5º face hook on 10" diameters and smaller. (On 12" diameters and larger - 20º ATB). They are also made with double-hard and 40% stronger C4 carbide. Thin kerf design saves 1/3 wood loss on each cut, feeds easily when used for moderate rips and crosscuts on a table saw. Eliminates bottom splintering on radial crosscuts. With the new 30º ATB tooth style, this blade stops splintering on ply veneers on both radial saws and table saws.